On the back of this book is one of the best blurbs I've ever encountered: “Imagine Poe and Steinbeck in a knife fight where Poe wins and writes Jack the Ripper's version of The Grapes of Wrath. 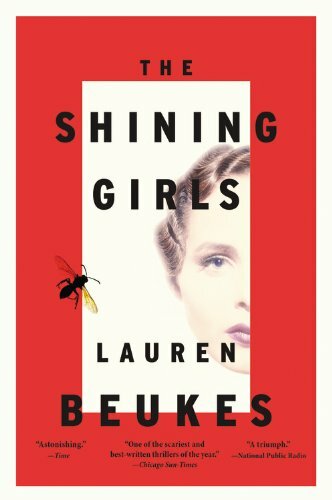 Lauren Beukes's The Shining Girls is even scarier than that.” This whimsical endorsement is from Richard Kadrey, an author I've never heard of, but now I may have to check him out. Anyway, Steinbeck and Poe and knife fights aside, The Shining Girls is a hallucinatory experience, circling around and around through time like a really long, bad trip. Harper Curtis is a murderer in the year 1931. Not a nice guy at all. Quite brutal and repulsive, in fact. He happens upon a house, and in the upstairs room the walls are covered with his handwriting. Names and objects flicker at him in varying degrees of brightness. These names are at once familiar to him and completely unknown. All Harper is sure of is that these girls, these shining girls, must be killed. One by one. By him. Oh, and the house lets him travel through time at will. Doesn't seem like a fair advantage for a serial killer to have, does it? Meanwhile, in 1993, tough and cynical Kirby Mazrachi has survived a brutal attack and is actively hunting down the man who hurt her, with the grudging help of newspaper writer Dan Velasquez. Harper doesn't know he failed to finish the job, and Kirby doesn't know Harper may be a lot harder to find than she thinks. They're on a collision course, though, and the reader can feel the inertia of it from the first pages of the book. Beukes really ratchets up the tension in the final chapters, as Kirby continues to put together details and inches closer to identifying Harper. The ending is heart-pounding, while managing to show how the loose ends were never really ends, just continuous loops that circle back on each other. It's a really surprising way to write a serial-killer novel, and Beukes makes it work, although sometimes the effort shows. Bottom line: Leave the light on, and read this book.